Two fused glass panels representing the Surrey Hills. My customers have a beautiful converted barn which has many original features but is essentially a very contemporary living space. Their dining room was very neutral with very little colour. This was where they wanted to add interest. They asked me to design panels to fit into their home which is situated at the foot of the North Downs on a working farm. The panels are mirror images of each other. One is the Surrey Hills in summer and the other in winter. 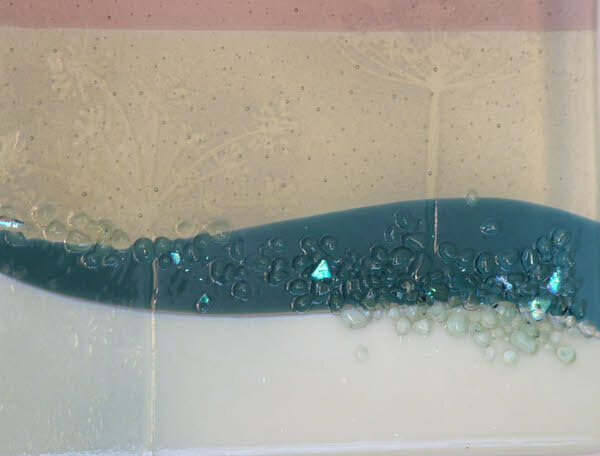 I have used my technique of using natural forms to produce images made with glass powders and dusts and then these are fired at different temperatures to achieve different effects. 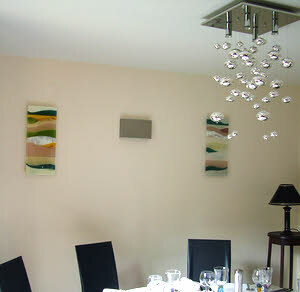 The panels are fixed to the wall using little brackets which are fixed to the back of the glass giving the appearance that the Glass Art is floating.